A few days ago, an advertisement featuring American actor David Duchovny talking about his love for Russia was uploaded to YouTube. The ad has already attracted more than two million views and provoked heated debate in comments sections and on social networks. RBTH analyzes the symbolism woven into the ad and the strong reaction to it online. 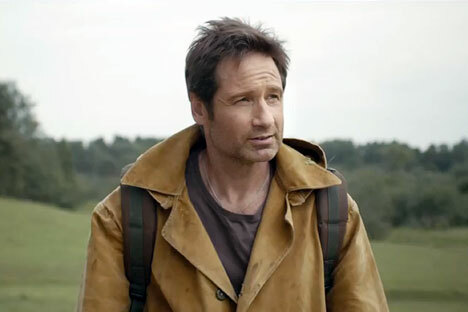 The Russian internet has been captivated over the last few days by a beer commercial featuring U.S. actor David Duchovny, star of the hit shows The X-Files and Californication. The video for the Sibirskaya Korona (Siberian Crown) beer ad, whose slogan is “You have something to be proud of,” shows Duchovny, whose family left Kiev for the U.S. before the 1917 revolution, pondering what his life might be like had he grown up in Russia. The comments sections on YouTube and other popular platforms, including social networks Facebook and VKontakte, are abuzz with responses to the ad, which has been uploaded and posted thousands of times. The commercial is the Russian national idea in miniature. Its protagonist lets his mind wander, asking himself, “What if things had turned out differently? What if I were Russian?” The commercial then flashes through a series of Russian and Soviet cultural and social archetypes, depicting images that are familiar to every Russian. First we see a photograph of the young Duchovny in his school yearbook, then a picture of him on skis in a Soviet athletic uniform. Then he appears in a cosmonaut’s spacesuit. What Soviet child didn’t dream of becoming a cosmonaut? The ad then doffs its hat to classical ballet by showing Duchovny working as a choreographer at the Bolshoi Theater, before we see him as a 40-year-old auditioning for Alexei Balabanov’s cult film Brother 2, one of the biggest contributors to the formation of the Russian patriotic consciousness in the 2000s. Duchovny recites a patriotic poem about Russia (“I found out that I have a huge family…”) before turning into a player for the Russian national hockey team, referencing another point of pride for Russians – sporting prowess on ice. By a curious coincidence, Duchovny’s first role was in an ad for Löwenbräu beer. Now, after becoming a Hollywood star, he has returned to beer ads, this time for a Russian brewer. Yet the majority of Russian viewers don’t see the advertisement as an advertisement. Some Russians consider it to be not an ad, but a film – and after all, films usually contain advertising. Other Russians, meanwhile, maintain it is a documentary film in which the real David Duchovny – not an actor – expresses his love for Russia. User Nikolay Wolf drew a parallel with French actor Gerard Depardieu, who recently became a Russian citizen. However, unlike Duchovny, Depardieu promotes Russia not on behalf of a character, but on behalf of himself. The video has also attracted some humorous comments. On YouTube, user Denis Denis wrote: “What Russian goes off-roading while wearing a seatbelt?” Another participant in the YouTube discussion, Alexei Marchenko, arrives at the paradoxical conclusion that such an expensive beer ad (the fee for an American star must be high) indicates that the alcohol business will fold in the near future. Otherwise, Marchenko writes, alcohol producers would not be trying to revive it with expensive ads. Yet many participants in these discussions, seemingly forgetting that it is just an ad and Duchovny is just an actor playing a role, are convinced that the actor is expressing his own personal opinion, and many Western commentators agree, with Duchovny being accused of making pro-Russian statements at a sensitive time in international relations between Russia and the West. The actor has now made a statement publicly defending the ad, in which he apologized for the timing of the commercial and stressed that it should not be seen as representative of his political viewpoint. In a statement issued to entertainment news site TMZ.com, Duchovny said: “I am proud of my Russian, Ukrainian, Scottish and Polish heritage as I am proud of my American heritage. Meanwhile, the ad has also raised indignation among Ukrainian social network users. In recent months, so-called kholivary (trolling sessions on the Ukraine topic) have been heating up. On the topic of the beer ad, many Russians are flatly dismissing the Ukrainians’ reproaches that Duchovny did it just for the money.